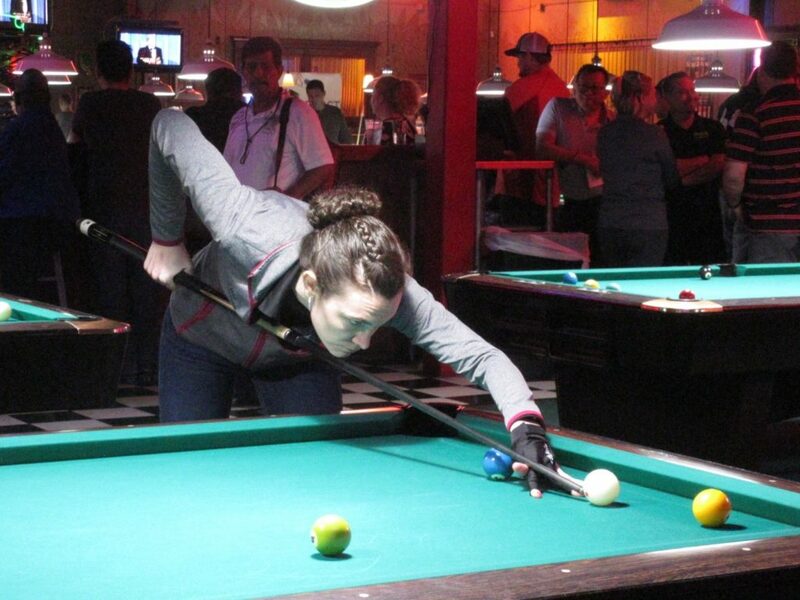 Building on her 2018, Gulf Coast Tour Most Improved Player Award, Ellen Robinson dominated a field of forty, elite, female competitors, to capture her first, 9-ball tournament win, at the 2019 Gulf Coast Tour season opener. In the finals, she faced off with Tour phenom, Robyn Petrosino, who won an incredible six straight sets before falling to Robinson in the second set of the true, double elimination final. 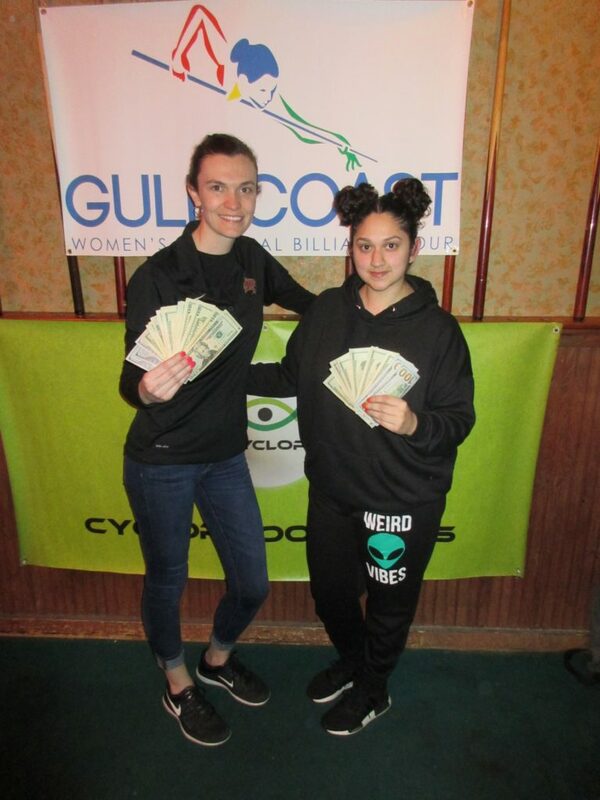 On January 5th-6th, 2019, sponsors Cyclop Pool Balls, Poison by Predator Cues, APA of North Harris County, Vapor Knights USA, Outsville Billiards, and Southern Streaming, facilitated a successful event for the Gulf Coast Women’s Regional Billiards Tour, paying out $1,800 in prize money, for the two-day, $1,000 added women’s 9-ball event. This event marked the Tour’s first-ever event at the famous Slick Willies Family Pool Hall, located at 5913 Westheimer, in Houston’s upscale, Galleria area. The Gulf Coast Tour would like to thank Slick Willies’ Director of Operations, David Kimmey, for making this happen, along with his entire staff, for hosting a first-rate event. “We are proud of the new relationship forged between the Gulf Coast Tour, and the Slick Willies Corporation”, says Tour Director, Kim Newsome. Slick Willies has been in business since 1974, boasting seven, Texas locations, in Houston, Katy, San Antonio, Austin, and one location in Oklahoma City, Oklahoma. “Slick’s” is well-known for its fun atmosphere, professional staff, and barrage of photographs and sports memorabilia, adorning the walls of each location. Slick Willies will host several stops on this year’s Gulf Coast Tour. The next event of the 2019 season is February 9th-10th, at Diamond Billiards in Port Arthur, Texas. Ellen Robinson made her way to the winners’ side final four with wins over Margaret Fox, Vada Selsor, Brittany Kromer, and Aryana Lynch, 7-2. Former Tour Champion, Belinda Lee, reemerged this event, snapping off the “Princess of Pool” Teresa Garland, Ginger Abadilla, 7-5, Kim Uptmor, 7-1, and Robyn Petrosino, 7-6. Loretta “The Gem” Lindgren defeated Jackie Rodriguez, D’Andrea McQuirter, 7-1, and San Antonio’s Kawania Watson, while Liz Mitchel ran through Ruth Paine, 7-3, Yvonne Asher, Sophia Lopez, 7-3, and Yvette Cox, 7-5. Vying for the final twelve, and in the money, first-timer Denna Davis shut-out newbie Pamela Chavez, while Michelle Yim ended newcomer Brandi Fendley, 5-3. Brittany Kromer slid by Michell Abernathy, 5-4, while Joyce Davis squeaked by Tam Trinh, 5-4. Petrosino took out D. Davis, 5-2, and Yim squeezed by Lynch, 5-4, while Kromer stopped Cox, 5-1, and J. Davis edged out Watson, 5-4. Back on the east side, Mitchel made quick work of Lindgren, 7-2, while Robinson dominated Lee, 7-3. In a first-time match-up, Mitchel and Robinson teed off in the hot seat match. A seasoned Mitchel gave Robinson a run for her money, but a determined Robinson pulled ahead to secure the set, 7-4. Advancing out of the final eight and beyond, Petrosino ousted Yim 5-3, and Lindgren, 5-2, while Kromer ended J. Davis, 5-2, subsequently falling to Lee, 5-3. Petrosino took revenge on Lee, 5-4, and defeated Mitchel, 5-1, to meet Robinson in the finals. Both ladies were competition-ready, on their game, and vying for their first Gulf Coast Tour victory. Following a heated exchange of ball pocketing and safety maneuvers, Petrosino took the lead and ended the first set, 7-5, but Robinson wasn’t about to let this one slip away. It was an intense, final set, and an impressive crowd gathered to watch the final balls fall. In the second set, Robinson was up, 4-3, and in the eighth game, pocketed the final nine-ball to win her first-ever, Gulf Coast Tour event! 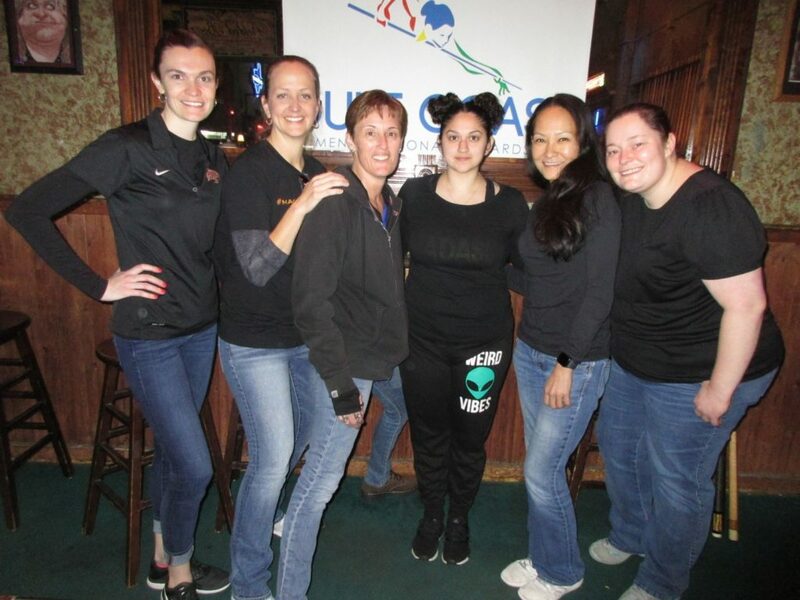 The Tour would like to welcome new members Ginger Abadilla, Jackie Rodriguez, Pamela Chavez, Denna Davis, Brandi Fendley, Julia Acevedo, Yvette Cox, Holly Lodrigue, Ashton Barak, Christie Castro, and Michelle Abernathy, who competed in their first event on the Gulf Coast Tour! The Tour would like to extend its deepest appreciation to everyone who assisted with running the board, selling raffle tickets, and spreading good will throughout the weekend. The next event of the 2019 season is February 9th-10th, at Diamond Billiards in Port Arthur, Texas. For more information, visit www.GulfCoastWomensTour.com.